This Sunday: The Ride. The Walk. The Party. Not the pants. All the details are in the video- date, time, location, what to bring, and how the ride works. Don't worry if it seems complicated at first- your Route Card will tell you everything you need to do and in what order e.g. "Get on Blue Line Outbound" and then "Rob a bank". It's our annual summer twoffer! Convert a car on the subway into a first class experience, then play and relax at the beach dressed to the nines. It's ok if the outfits aren't in good condition or don't fit great- just no gag outfits/costumes. 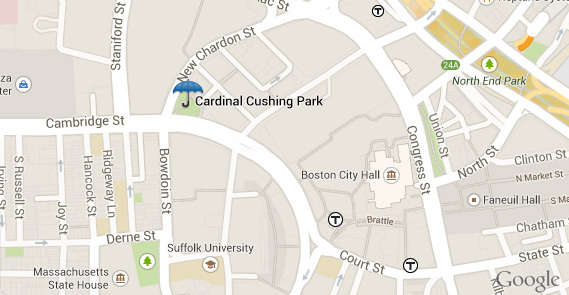 Meet at Cardinal Cushing Park at noon and look for any people holding a black umbrella. Bring whatever you would normally bring to the beach, such as a towel, a change of clothes, a book, a frisbee, sandcastle stuff... and a bag to hide all that in. We will provide a number of props for the first class subway portion, but if you have white gloves or white rags, please bring those as well. If you can play a string or woodwind instrument, please get in touch by replying to this email. Black Tie Beach is the brainchild of Improv Everywhere. Check out their official announcement. Black Tie Beach (along with the No Pants Subway Ride) was started 4 years ago by NYC based arts group, Improv Everywhere. For the second year in a row, join BostonSOS at America's oldest public beach donning your best. If you're bringing a boombox, be sure to play something classy. Get all the details here and RSVP & share via Facebook. It's kind of like power walking... except you're dancing... to music only you can hear. Join us for some crazy tomorrow morning before the weekend weather turns sour. BostonSOS regularly hosts flashmob-inspired events that combine street theater, surprise, and utter silliness. You can register for upcoming events from the Get Involved link in the top menu. Below is a collection of just a tiny fraction of the funny, zany, prankish stuff we do around town.